As I’ve mentioned in my previous post, I had a fun shoot for Blackberry’s Playbook last week. 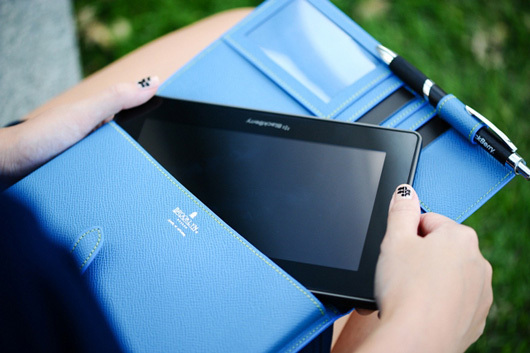 The Playbook is the world’s first performance-grade tablet and it has been available in the Philippines since August. To celebrate its launch, Blackberry introduced an exclusive “Made for Playbook” accessories collection. 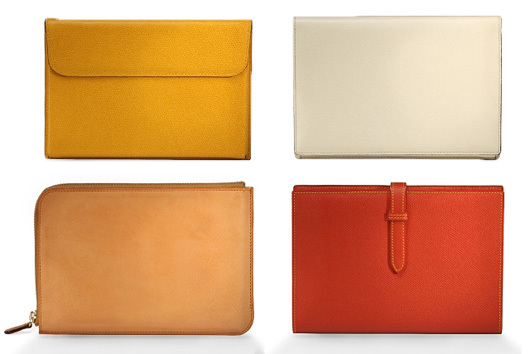 The collection features seven contrasting cases designed by brands from around the globe, including Delvaux, Valextra, Ettinger, Brooklyn, Porter, WANT Les Essentiels de la Vie and Ganzo. Before checking the accessories out, I was able to test the Blackberry Playbook for a short while during the shoot. If you’ve been following my blog, I think it’s pretty clear that I use everything Apple–Macbook Pro, iPad, iPhone, everything! I’ve only been introduced to Blackberry recently when I received my white Blackberry Torch as a gift from Blackberry Philippines. I’m still an Apple user but I also love my new Torch which is why I was really excited to see what the Playbook has to offer. 1st of all, it’s REALLY light! Although I love my iPad, I hate it’s weight. Just carrying it around with my dSLR in my bag already feels like I’m carrying a TON. The Playbook only weighs a pound. YES. O-N-E pound. And it’s really tiny too! It fits perfectly in a small purse! 2nd, the apps. I know that aside from the Apple iOS, the apps are probably one of the main reasons why we’re not brave enough to make the big switch. But in fairness to the Playbook, it has some really great apps too! There’s this popcorn game which is basically the same as Fruit Ninja. It also has Need For Speed and Doodle Blast which you can download for FREE. Decent apps for documents and office files like Excel, PDF, etc. can also be downloaded for FREE! 3rd, I love the visuals and graphics! I’m not techie so I don’t really know the specs. I’m just basing this on my own thoughts. I feel that they’re more vibrant and clear. Other notable features of the Playbook are its HD camera and Adobe Flash support. Don’t you just hate not being able to watch online videos? With the Playbook, it’s possible! Is the leather of your shoes made of ostrich? Looks like ostrich skin to me.